Bulls News would like to wish all our readers a Happy New Year. 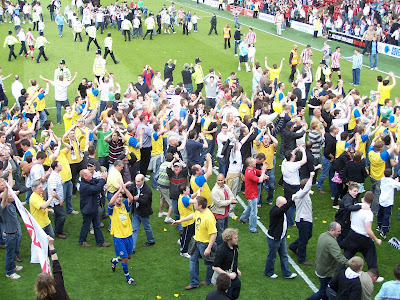 2008 started well with the Bulls chasing promotion which was achieved at Brentford on the last but one Saturday of the season. But the latter part of the year has been more difficult with the club finding life in League One quite tough. 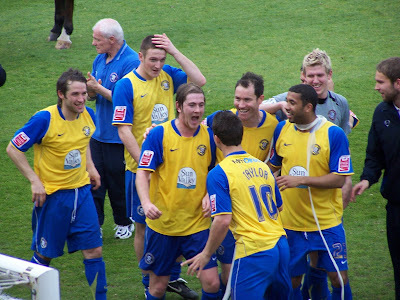 2009 will start on a high with the visit of Leeds United to Edgar Street on Saturday. Also, the opening of the transfer window will bring the hope that a few more players will join the club in the next month to help the fight against possible relegation. Meanwhile Bulls News has had its most successful year to date in terms of visits to the main site. Recently an additional site has been launched, www.bullsnews.co.uk, which mirrors the content on the main site but isn't always updated quite as quickly. It also acts as a back-up site should the main site not be available for any reason. Hits on the 'new' site has been disappointing to date but it will continue for the remainder of this season when its future will be reviewed. Finally if any reader is wondering why the title of this article is in both Welsh and English - Bulls News recently had a request from a Welsh speaking Hereford United supporter for some Welsh content on this website. And this seemed an appropriate time of year to respond. Jimmy Quinn is the latest manager to quit League football. Quinn has parted company with Bournemouth after just four months. It took the 'new' board at Dean Court, set up after the chairman sold his shares to a consortium, just a few hours to make the decision. He is the shortest serving manager in the Cherries' League history, lasting just 121 days. Most Hereford United supporters have probably forgotten that Quinn once played for the Bulls. He made his debut against Rushen and Diamonds in October 2000. A disastrous signing by Graham Turner, Jimmy Quinn played for just two and a half matches for Hereford United. Signed from Northwich, he was a flop and the team failed to score at any point when he was on the field. In his last game for the club, against Dover, he was bought off at half time for Rob Elmes with the side 2-0 down. Hereford went on to win 4-2. For most, if not all, Hereford United supporters it has to be Saturday April 26th. 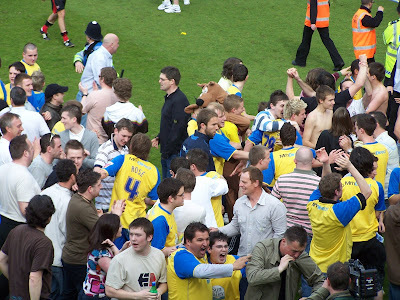 That day the Bulls clinched promotion to League One after defeating Brentford. MK Dons are to sign Norwich winger Luke Chadwick on a free transfer. He will sign a two and a half year deal after scoring three times in eight games for the Dons earlier in the season. Hartlepool winger Joel Porter will quit the club at the end of the season to return to Australia. Droylsden have lost their appeal against being kicked out of the FA Cup. Colchester have recalled striker Jamie Guy from Oxford. The 21 year old was due to stay with the Conference side for the season, but injuries have limited his chances. Leicester have loaned teenage striker Ricky Sappleton to the Kassam Stadium side instead. The 18 year old previously had a month at Bournemouth. ex-Bull Phil Gulliver is to rejoin Corby from Oxford City. The 26 year old left Rushden for Corby, then quickly joined Oxford, but has returned to his hometown side after they assembled the right financial offer. Southend have confirmed the permanent signed of midfielder Jean Francois-Christophe on a two and a half year deal. The Portsmouth reserve has spent the first have of the season at Roots Hall. Scunthorpe have extended the loan of defender Krystian Pearce from Birmingham until the end of the season after 20 appearances since joining in August. Carlisle have lost the services of loanee Chris Birchall after the Coventry midfielder opted to seek a move to US soccer than stay with the Cumbrians. Oldham have offered striker Lee Hughes a new contract said to be the biggest in the club's recent history. At the moment he has a buy-out clause that they fear will be triggered in January. Bournemouth have new owners after the club confirmed that Paul Baker had sold his 50% stake in the club to local businessman Adam Murry. 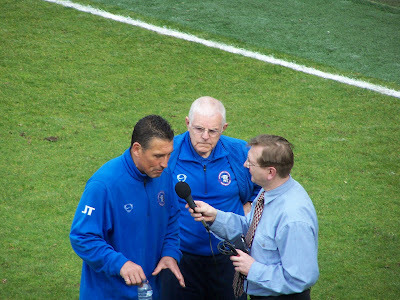 The former Chester director may now decide to return to his former club. The Deadline for purchasing tickets for the Leeds game on Saturday is Noon today. Many sections of the Main Stand are now sold out but according to the Official Website there is some space on the Meadow End and a few other spots. Meanwhile the pitch could be a potential problem on Saturday should the cold snap continue. The Met Office are predicting a temperature of -3C around Hereford for Friday night rising to 1C on Saturday afternoon. Both Andy Williams and Josh Gowling could return to their respective clubs after Saturday's game against Leeds if their present loans with Hereford United are not extended. Williams came to Edgar Street from Bristol Rovers in early September. Gowling was loaned by Carlisle to the Bulls last month. Of the two an extension to Gowlings loan looks the more important. He has partnered both Karl Broadhurst and Dean Beckwith at the heart of defence. Whether Turner will wish to keep Williams is probably dependent on whether he can bring in anyone better without breaking the bank. Football League chairman Brian Malwhinney has warned clubs to cut costs to survive the current credit crunch. "Things look calm now, but the crunch comes in the run-up to next season. Crowd numbers have held up so far, but they won’t as things go on. The next three years are going to be terrible and football is not immune to the problems in the wider economy. "Clubs will have to slim down. The sensible club chairmen will have put downward pressure on their costs. The big problem is player contracts, which have to be honoured. We have seen the result of soaring wages in the Premiership having the effect of dragging up pay in all the other leagues, right down to the Conference." Malwhinney's prediction that the problem will last for three years flies in the face of the Government's own claims that the crisis will be solved by next Autumn but his prediction is in line with - what one friend of mine debatably claimed - 'people who live in the real world'. Stevenage chairman Phil Wallace was stark in the effect of the crunch on his club: "In September, October, November and the first half of December income fell off a cliff and we have lost more in those three or four months than we made in the previous two years. Anyone supporting lower-league clubs should be concerned. If we don’t change, the chances of surviving what I expect to happen in 2009 and 2010 will be greatly reduced." Wallace's words suggest they're losing £30,000 a month, or more, at the current time having made £75,000 last season alone. Eleven of the 24 Conference sides have warned of financial difficulties this season, even though gates have been relatively steady across the board, thanks to rising off-field costs. The January transfer window may well be a buyers market, with players scrambling for any deal they can get as squads are slashed across all the divisions. Any club that offers more than a deal until the end of the current season will be braver than most. Accrington winger Bobby Grant was one of the five other people arrested with Steven Gerrard following a nightclub incident, but the teenager is yet to be charged. Goalkeeper Ian Dunbavin was also part of the group, but was not arrested. Leeds have taken York assistant boss Neil Redfearn to head up their youth team. Brighton man Steven Thompson will join St Mirren in the transfer window after requesting a move back north for family reasons. Geoff Horsfield has agreed a short term deal with Lincoln following his cancer treatment. Northwich owner Jim Rushe is one of several bidders trying to secure their Marstons Arena home. The stadium sale particulars can be seen here. This is a short reminder that you can now predict for the upcoming Leeds match. The deadline is on Saturday at 2.30pm. As always, send an email to bullsnewspredictions@hotmail.co.uk stating your final score and attendance predictions. Remember to include your username. Former Hereford United defender Tamika Mkandawire could be leaving Leyton Orient in the transfer window. According to the Daily Star, both Cardiff City and Swansea City are interested in his signature. Mkandawire has recently returned to fitness after a thigh injury. Wolves are also thought to be tracking Mkandawire. Charlton Football Club have confirmed that the loan of goalkeeper Darren Randolph to Hereford United has been cancelled. Randolph can play for Charlton in their FA Cup Tie against Norwich next Saturday assuming he is chosen. Had he played for Hereford in the FA Cup game against Dagenham and Redbridge in early November he would have been cup-tied. 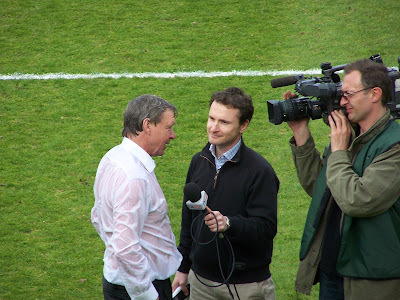 As is well known he refused to play telling manager Graham Turner of his decision just two hours or so before kick-off. 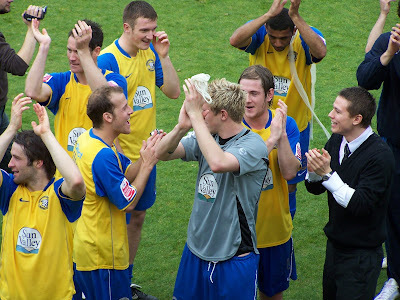 Current number one keeper Craig Samson deputised that afternoon. With the loan cancelled 'at the onset of January' - according to Charlton - and Randolph being able to play on Saturday for them, it looks as if Graham Turner would be able to sign another keeper, should he want to, before Saturday. Until this week he was prevented from signing a goalkeeper attached to a Conference or higher level club because, in theory at least, he had two fit keepers on the books. Meanwhile what isn't revealed by Charlton is whether Hereford have to pay their element of Randolph's wages for the rest of the season - it was a season long loan. League One gates this season are down by 5.3% but the fall is not quite as bad as feared earlier. At one stage gates were down by nearly 7%, but recent large attendances at places like Leeds and Leicester have stemmed the fall. Hereford United's gates are, currently, mirroring the League trend by also being 5.3% down but with the Leeds game on Saturday expected to attract by far the best gate of the season that 5.3% figure will fall. Currently Hereford United's average gate is 3241. The final figure last season was 3421. During this decade the highest gate at Edgar Street was achieved in 2003/4 Conference season when there was a figure of 3704. In percentage terms Hereford have done better than Leicester where, despite topping the League at present, gates are down by 16.8% on last season. Leeds are also showing a drop - down by 8.9%. All figures from Tony Kempsters excellent site. The Bulls entertain pre-season title favourites Leeds United in a League One clash on Saturday. 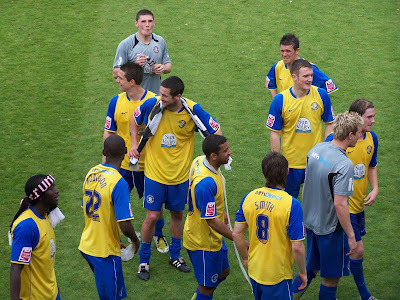 The two sides had never met competitively until last season when the FA Cup paired the two 'Whites' together. After a goalless draw at Edgar Street, the Bulls won the replay with a solitary Lionel Ainsworth goal. Earlier this season Leeds scored their first ever goal against the Bulls, after 252 minutes, to secure a 1-0 win in the League. The Bulls are playing well, but the final product isn't quite there. Steve Guinan has scored four times in the last four home matches and that coincides with the return of Lionel Ainsworth, who has had a hand in four of the six goals scored since his return. By the time Saturday comes around the future of a number of players should be clearer with deals expiring and the transfer window opening. Leeds expectations to walk the division haven't exactly come true - again. This time it has cost manager Gary McAllister his job after getting 'just' 33 points from 22 games this season. New boss Simon Grayson made an instant impact with a win at Stockport, and will bring reinforcements in during the transfer window to cut the gap to the play-offs from the current five points. Hereford United vs Leeds United, Edgar Street, Saturday 3rd January, 3.00pm. Northampton are hoping that Leeds sell midfielder Brad Johnson in the January window. The Cobblers are entitled to a sell on clause, and earning the fee will mean they will not have to sell players in January. Cheltenham have agreed a payoff with player Craig Armstrong. The veteran is currently on loan at Burton, and he will officially be released on the loan's completion. Millwall have been linked to Stevenage striker Steve Morison. The 25 year old, who can leave Stevenage on a free in the summer if they don't get promotion, has scored 63 times in 115 games for the club. He started his career as a trainee at Northampton, scoring only three times in 28 games. Tranmere are to take Stoke defender Ryan Shotton on loan for the rest of the season. The 20 year old played 19 times for the club during a three month loan earlier in the season. Crewe are to extend defender Dennis Lawrence's loan from Swansea until the end of the season. The former Wrexham man has played 11 times for the Railwaymen so far. Peterboro have admitted that one of their striker targets was Arsenal youngster Jay Simpson, who is set to join West Brom. MK Dons will extend the loan of defender Shaun Cummings from Chelsea until the end of the season, while boss Roberto Di Matteo and his staff have signed new two year extensions to their contracts. No Bulls in the Team of the Week. Leeds, Tranmere, and Scunthorpe have two players each in the team. Brighton have extended the contract of injury plagued defender Martin Hinshelwood until the end of the season. Carlisle have released teenage defender James Earl after he failed to make an impression after signing a six month pro deal in the summer. Dagenham are under no financial pressure to sell players in the January transfer window. The Bulls have previously been linked to striker Ben Strevens, and a number of their players are being watched by higher graded clubs. Scottish side Livingston have failed to pay their players December's wages. They are currently being sued for £300,000 by their former owner, while other creditors have slammed the club. Oldham have recalled striker Craig Davies from his loan at Stockport as they have no more games left before the loan was due to expire. Stockport manager Jim Gannon is claimed by the Daily Mail to be on the verge of quitting after falling out with the club's board. With precisely half the League season gone, we look at the heroes and villains so far. In front of goal it has been something of a disappointment with just 17 goals from the 23 games. Eight seperate players have scored League goals this season, but only two players have scored more than one. Bradley Hudson-Odoi is second in the table, the last of his three goals coming in only the fifth game of the season, with Steve Guinan leading the charts with six. However Guinan's record in shooting isn't so great, getting just 16 of 35 shots on target. If you want a shot on target, give it to a midfielder - with Matt Done getting 13 of 17 shots inbetween the sticks, Ben Smith getting 12 of 17, and Lionel Ainsworth getting 11 of 19. Stephen O'Leary would do well finding one of those three with just three of his 13 efforts on target. In terms of Assists, Ainsworth has created three - and scored one - of the six goals the Bulls have scored since his return. Nine other players have credited assists, including keeper Matt Murray for Sam Gwynne's goal against Cheltenham. The Bulls have used a total of 27 players in the League, including four goalkeepers and nine loan players, with Jack McLeod having the least time (41 minutes) on the pitch. Toumani Diagouraga is ever-present in League games, with Kris Taylor and Guinan playing in all but three matches. Karl Broadhurst is the only player to be banned for five yellow cards, but only three of them were in the League. Taylor has four in the League while O'Leary and Diagouraga both have two cards, with no-one else on more than one. Diagouraga leads the fouls count having committed 23, but only Moses Ashikodi (nine fouls in six games) and Sam Oji (five in four) have committed more than one foul per game. The Bulls have the dubious pleasure of being the least attractive fixture for only one side. Only the trip to Southend got their lowest gate of the season. The Shrimpers themselves are one of four sides to be least attractive to two of their opponents. At the other end of the scale, Leeds have set season best attendances at eleven of the twelve grounds they've visited. The twelth was Northampton, who they had just played in the FA Cup - twice - the week before. There is little doubt that Hereford United have been singled out by West Mercia Police recently. The force were, once again, out in large numbers last week when Tranmere played at Edgar Street. And whilst Wigan won their recent appeal against Greater Manchester Police over police costs, it is not yet certain that charges for policing around Edgar Street will be lowered or even dropped. Data released by the Police show that the Bulls have been asked to pay substantially more money for policing than any other sports club in the area. Figures obtained under the Freedom of Information Act reveal that Hereford United has been asked to pay nearly eighteen times as much as near neighbours Shrewsbury Town, who although in a lower division, have higher gates. The Police say that as the number of matches policed varies for each club and so does the operational requirement for each match, these figures should not be used in comparison with one another. The figures viewed in isolation without proper interpretation could be misleading. However they don't say what 'proper interpretation' might be. Although Hereford United are in League One and play teams with generally larger away followings, the difference in the figures between Hereford and Shrewsbury seems untoward. Worcester Warriors attract attendances three times larger than Hereford, and significantly more suppporters than Shrewsbury. Shrewsbury's figure was for 14 League and Cup fixtures, while Hereford's covers 12 games. Per match, the Bulls paid more than Shrewsbury - on average - for games this season - £1950 a game to £96 a game. As a comparison, West Mercia Police were also asked about policing costs at two other local venues. Three Counties Show at Malvern: £1,560 plus VAT. Finally, West Mercia Police were asked about the costs of policing the 'Sequani' demonstration at Ledbury which occured on Saturday September 6th the day after Hereford United's home game against Swindon which prompted this article. The animal-rights campaigners held the protest outside the Sequani base, and twelve people were arrested. We also asked the police if any of the costs of the operation might be reclaimed from either the owners or those protesting. The total cost of policing the demonstration at Ledbury on Saturday September 6th 2008 was £17,549.36. Please be advised that the total cost has been disclosed on this occasion, however, any requests for further information on this subject may attract exemptions. There are currently no plans to reclaim any of these costs. Please note that this differs from arrangements for providing policing for special events, including football matches, as these are governed by the 1996 Police Act and a Home Office circular which allows for the provision of such policing and costs’ recovery. This enables forces to police special events without taking officers away from their normal duties. Graham Horwood will be the referee in charge of Leeds' visit to Edgar Street on Saturday. The Luton based official last reffed the Bulls in September in their trip to Southend, and previously officiated at Edgar Street against Rochdale the previous season in his first season on the League list. Overall he has sent off three people, and issued 49 yellow cards, in 19 games this season. Notably he was the referee for Shrewsbury's 1-0 win over Rotherham at the start of December, with the Millers having two players sent off. He will be assisted on Saturday by Andrew Rodda, who is deaf. The Exeter based official relies on lip reading rather than a hearing aid during matches as sweat and rain damage the device. Rushden fans are to protest against manager Garry Hill at their next home match. Having nicknamed the former Dagenham man 'Benny Hill' for his short tenure at the club, fans were incensed at comments by Hill calling them morons. Ex-Bull Jimmy Quinn has refused to resign as Bournemouth boss despite winning just seven of 25 games in charge. The club remains seven points short of safety. New Huddersfield boss Lee Clark will have to offload players before he can bring new faces in. 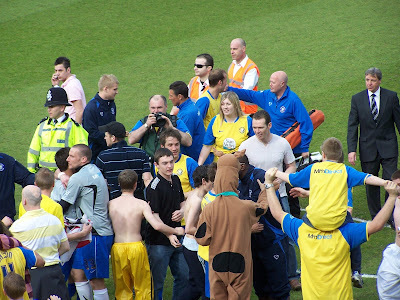 The Terriers have one of the largest squads in the division. Brighton have extended the loan of defender Joel Lynch to Nottm Forest until the end of the season. The 21 year old put in a transfer request in the summer, and has spent most of the season with the Championship strugglers. Northampton have had loan defender Kyle Walker recalled by Sheff Utd. The 18 year old made nine appearances for the Cobblers. Droylsden have been kicked out of the FA Cup for fielding an ineligible player. Chesterfield will take their place in the competition, subject to an appeal. Peterboro have allowed Cambridge to keep striker Scott Rendell until the end of the season despite their war of words last week, with Liam Hatch also staying with loan side Darlington until the summer. Scunthorpe have lost midfielder Ian Morris for two months with a knee injury. A statement from Stockport's chairman says their Police costs so far this season have been £70,000. Crawley have confirmed that they are being investigated for fielding a player not registered with the Conference, although the same player is registered with the FA. Mansfield have named David Holdsworth as their new manager. The former £1million defender has been boss at Ilkeston Town since the start of 2008. Oldham striker Lee Hughes is a target for Doncaster, as is former Bulls loan target Steve Brooker. With the recent announcement that "Morro", who currently runs Legends Bar, is to leave, the possibility of having not a single licensed drinks outlet at Edgar Street is another loss to the fans' football day out. 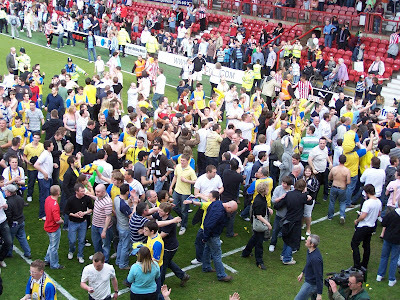 For many years, the opportunity to "have a beer" before the game has been, to a large number, an important part of their matchday experience. For another person to take on the premises, the business would need to display the ability to operate at a sensible profit level. If the rumoured annual rental of over £20,000 is true then making a worthwhile profit would appear difficult to say the least. A season of, say, 25 games equates to £800 per match just to cover the rent and staffing costs are likely to increase that figure to probably £1000. A gross profit margin of, for example, 50% would therefore demand a "take" of around £2000 just to break even. If the capacity of the room is less than 200 then it can be seen that each person would need to spend an average of over £10 per head. "Morro" is believed to be finishing his residency after the Leeds game and any new occupier will certainly need their business wits about them to make it work financially. The premises is believed to be currently on the old Supporters Club licence - hence the membership cards. They have no requirements therefore for any personal licence holders or SIA badged staff as they would on a normal pub licence. It might also, technically, limit their ability to offer the room for functions to members only. All tenders must apply in writing to Hereford United FC, Edgar Street, Hereford HR4 9UJ. Tickets are still available in all areas of Edgar Street for next Saturday's home game against Leeds United. Wednesday December 31st 9am to 12 noon. The club says that no tickets will be sold on match-day. UPDATE 6pm: Bulls News would like to apologise to anyone who tried to contact the club today. Unbeknown to us the office was closed. The information that the office would be open was taken from the Official Website last week. This afternoon the official site posted that the office was shut. FURTHER UPDATE 12 noon Tuesday: The Official Website has contacted Bulls News to say that our update yesterday was factually incorrect. They say that the Official Website reported on December 21st that the office would be closed yesterday. On the field at the Walkers Stadium this afternoon the Bulls may not have won the match but in the stands the away support once again did all they could to raise the spirits of the Bulls. The Hereford United supporters were all sat in a corner of the ground to the left of the goal. Keep to a limited area, the atmosphere created by the 636 was loud enough to be heard by manager Graham Turner in the dug-out area on the far side of the pitch. Asked for a wave during the second half when the Bulls were two nil down he duly responded. The most vocal Foxes were sat to the left of the travelling support. 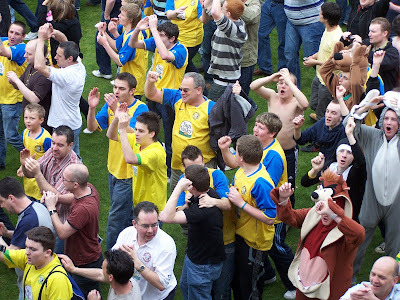 They appeared to be led by a large bare-chested gentleman with a drum but even with him making as much din as he could, the Foxes found it hard to compete with the Bulls for quality of the chanting and often for sheer noise. In fact the drum was only heard for the early part of the game. It's not certain why the drummer gave up. The rendering of 'let's pretend we've scored a goal' was even noted by one of the Leicester websites. When it was sung just after the Foxes scored their second goal few probably thought that minutes later the Bulls would be celebrating a goal themselves. And to be fair the stewards were fairly relaxed about all the singing and standing until the 'let's all have a conga' chant started. The parade of twenty or so young Bulls supporters moving towards the stewards was probably one step too far and they soon returned to their seats. A good day out to an impressive stadium. Keeper Craig Samson spoke about the game at Leicester to BBC Hereford and Worcester. "I think we were a bit unlucky in the end but in the first half we were under a lot of pressure. "They scored that early goal which took the sting out of the game but we managed to hold out to half time. "After they scored the second goal and we got the goal and for the last ten minutes we had our chances. But I think they deserved their win at the end of the day. "We nearly did get another goal. We had a couple of chances with the ball in the box and we put them under a bit of pressure but it wasn't to be. "I don't think we have given up in any game. Everybody gives 100 per cent." Leicester City assistant manager admitted after the game that he wasn't totally happy with the Leicester performance. "Our level of performance was mixed today, but we will take the three points. We just couldn't get the third goal that we deserved, which leaves you on a knife-edge," he told the official Leicester website. 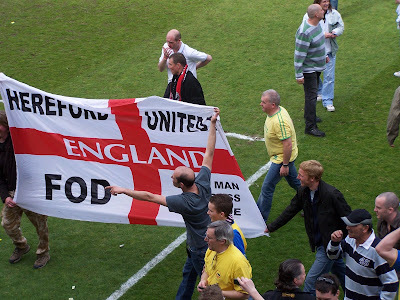 "Fair play to Hereford - they came back into it and made us a little bit edgy. "We had to dig in. It was our second game in three days and there were a lot of tired legs out there. "We could have taken the game by the scruff of the neck more than we did - but the three points is the most important thing. It keeps the run going and hopefully we will be where we want to be at the end of the season." Meanwhile for Hereford Ben Smith spoke to BBC Hereford and Worcester. "We're a little bit disappointed as we didn't start great and obviously them getting the first goal was exactly what they wanted. "We've had a little flurry in the last 15 or 20 minutes and could have maybe nicked a draw but I don't think that was what we really deserved. "Leicester are a good side and they showed that today." Whilst the end of 2007 ended with a win at arguably League Two's biggest team Bradford City, today's trip to Leicester City resulted in a 2-1 defeat for Hereford United. A bumper crowd of 22,920 were present at the Walkers Stadium as Steve Howard knocked the home side into an early lead. The lead was doubled in the second period by Andy King before Karl Broadhurst pulled one back late on. Two changes were made following the Boxing Day draw with Tranmere Rovers; Broadhurst replaced Dean Beckwith to partner former Bournemouth team-mate Joshua Gowling at the heart of the defence and Andy Williams made way for Nick Chadwick up top. Leicester included a wealth of talent and experience in their line-up; David Martin and Jack Hobbs are on loan from Liverpool, whilst joint League One top goalscorer Matty Fryatt, subject of much interest from higher graded sides, partnered former Derby County striker Howard up front. United had the first shot of the day with Matty Done firing into the body of Martin from the left-hand side before the hosts started to stamp their authority on the game. King sliced over from long-range whilst soon after Kris Taylor made a pivotal block to stop a goalbound Matt Oakley effort following strong wing-play from Lloyd Dyer. The opening goal came just 10 minutes into the game after a pass found Fryatt, and his attempted pass took a lucky deflection into the path of Howard who steered the ball into the net past Craig Samson. A strong forward run from the unchallenged Mark Davies saw the Wolves loanee drag a shot wide before some excellent flowing football should have resulted in a second goal for Leicester. Howard switched play to Fryatt, who had drifted out to the wing and he picked out the forward run of Oakley who shot first-time forcing a decent reflex save from Samson to push the ball away fror a corner. Former MK Dons winger Dyer shot past the post after Hereford failed to clear a cross fully before they managed some opportunities themselves. Taylor sent a 60 yard cross field pass to Lionel Ainsworth, who delightfully controlled before testing Martin with a snapshot half-volley. Chadwick rose well to meet an Ainsworth corner from the right but saw his effort drop wide whilst Steve Guinan also won an attacking header in the box, this time from a deep Richard Rose free-kick but Martin held on with ease. Late on in the half, Joe Mattock replaced Bruno Berner, perhaps as the young Englishman was better equipped to deal with the threat of Ainsworth. Moments before the half-time whistle, Samson made a fine save to deny Fryatt in behind the defence by rushing out to block an effort from the striker after a flick-on by Howard had caused problems. Nigel Pearson opted to replace Fryatt at half-time, with the experienced Paul Dickov replacing him. The former Man City striker tried his luck with a lob after collecting another Howard flick but his effort failed to trouble Samson. Graham Turner introduced Williams up top to give the City defence something different to think about with Chadwick making way. A strong forward run from Dyer caused problems for Rose, but the winger sliced his shot harmlessly wide. A trip to Gowling allowed Leicester a chance with a free-kick; King stepped up and forced Samson to make a diving save to divert the ball around the post. Oakley then tried to place a shot from 25 yards but failed to hit the target. A superbly weighted through ball from Ainsworth presented a good opportunity for Guinan but he didn't quite have the pace to escape the pressure of the tracking defenders and his left-foot shot was straight at Martin. King shot over from long-range after Howard had set him up whilst at the other end, Williams' cross from the left eventually made its way to Rose but the full-back struck tamely past the near post. The second goal of the game all started with yet another Howard flick causing havoc in the Bulls' defence; the ball was eventually cleared out as far as King who shot into the far corner past Samson to the delight of the home crowd. Yet, eight minutes later Hereford sprang a surprise by netting their fifth away goal of the league season. Ainsworth sent a free-kick from the right towards the back-post and Broadhurst was on hand to send a bullet header past Martin. It made for a nervy finish for the league leaders although Oakley and Howard both send half-chances wide. In the final moments of normal time, a push on Williams presented Taylor with a chance but the versatile player's left-footed curling free-kick dropped agonisingly past the post. Stoppage time saw City sub Nicky Adams, who had replaced Dyer, booked for a dive when looking for a penalty whilst a late Ainsworth corner came to nothing. Leicester are the best that League One has to offer, and Hereford today were by no means disgraced. The hosts passed the ball around well whilst having some real threats up top, but United at times showed they can mix it with the big boys playing some neat football themselves. With January looming, The Bulls need to bring in a couple of new faces; a striker is still a must if they are to give themselves a chance of surviving the drop. Next up is the visit of Leeds United in six days time. Hereford: Samson, Rose, Broadhurst, Gowling, Taylor, Ainsworth, Smith, Diagouraga, Done, Chadwick, Guinan. Subs: Veiga, Beckwith, Gwynne, Johnson, Williams. Leicester: Martin, Gilbert, Morrison, Hobbs, Berner, Oakley, Davies, King, Dyer, Howard, Fryatt. Subs: Cisak, Edworthy, Mattock, Adams, Dickov. Below are the main stats from this afternon's match at the cold and crisp Walkers Stadium. No Hereford United player was booked. Captain Karl Broadhurst received a mark of eight for his efforts with Craig Samson, Toumani Diagouraga and Richard Rose all receiving a seven. Attendance 22920 with 636 in the away end. With leaders Leicester claiming three points, second placed MK Dons followed suit with a 2-0 win over Southend. Millwall's 1-1 draw with Yeovil sees them lose pace with the leaders but keep third spot, while Peterboro are back up to fourth after a topsy turvy game eventually saw them beat Cheltenham 6-3. Oldham remain fifth after a goalless draw with Carlisle, with Scunthorpe down to sixth after a single goal loss to Huddersfield. Leeds beat Stockport 3-1 to put their season on the right track. Down the bottom Crewe beat Hartlepool 4-1 to move within a point of the Bulls, while Cheltenham's hammering makes their goal difference worse than the Bulls. Leyton Orient slip into the relegation zone after losing 1-0 to Colchester, who move into the top half. Brighton's 2-0 win over Swindon moves them up above the Robins and a point clear of the danger zone. Bristol Rovers shared a goalless draw with Northampton. In League Two Wycombe's lead is cut again after another 1-1 draw, with Brentford beating Exeter 2-0 to drop the gap to five points. Shrewsbury move up again, but needed Bury to have a man sent off before they won 1-0. Barnet beat Bournemouth 2-0 in Paul Fairclough's final match, and Chester lost 3-1 at Macclesfield. In the Conference Oxford smashed Ebbsfleet 5-1, while Histon closed the gap on non-playing leaders Burton with a 4-1 win over Grays. Kidderminster beat Torquay by the only goal, scoring with their only shot on target, and Forest Green beat Barrow 2-1 to move out of the relegation zone. The Bulls were beaten by leaders Leicester 2-1 in today's League One match at the Walkers Stadium, but it was far from the walkover some had predicted. Karl Broadhurst handed the 636 Bulls fans a glimmer of hope for something from the match when heading home a Lionel Ainsworth free kick to set up a dramatic final ten minutes. Steve Howard had given the Foxes an early lead but the comfort of a second goal took another hour to arrive from Andy King as the Bulls held firm before the nervy finish. Nick Chadwick and Karl Broadhurst were given their first starts in a month in place of Andy Williams and Dean Beckwith. The result sees the Bulls remain in 23rd place, but the gap to safety is extended to six points after Brighton's win over Swindon. BBC Hereford and Worcester will have a sports special this afternoon with commentary on the whole of the Leicester City/Hereford United League One match from the Walkers Stadium. Matt Baker, the former Bulls goalkeeper, is set to join Keith Hall at the commentary point. As usual this broadcast will only go out on 94.7FM in and around most parts of Herefordshire. Text commentary will be available from the usual media outlets. Finally a gate of between 21,000 and 24,000 is expected this afternoon. Recently at Leeds the Bulls played in front of 25,676. Whether this gate will be exceeded remains to be seen. The highest gate at the Walkers this season to date, 23,390, was against Peterborough. 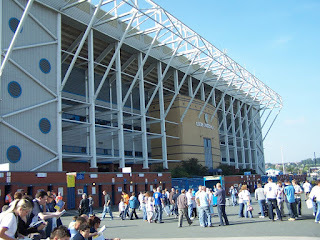 The top gate in League One, 33,580, was last Saturday at Elland Road when Leicester were the visitors. As reported earlier this week Andy Haines, from Tyne and Wear, is set to referee this afternoon's League One game at the Walkers Stadium. He hasn't had the priviledge of being the man in the middle for any Hereford United game to date so there is little known about him. Haines started refereeing in his native London in 1995 being promoted Class 3 to Class 1 in only three seasons. In 2000 he relocated to the North East and in 2003 was promoted to the National List of Assistant Referees after having successful seasons on the Wearside and Northern Leagues. After two seasons as a Panel referee he was promoted to the National List of Referees in 2007. So far this season he's been in charge of 15 games giving out 38 yellow cards and just two reds. Barnet boss Paul Fairclough is to relinquish the manager's role at Underhill. Ian Hendon will take temporary charge with Fairclough taking a boardroom role to go along with his England 'C' team duties. Northampton have released striker Ian Henderson after he failed to score in 33 first team games. His last senior goal was for Rotherham in April 2007. As time goes on it's amazing how many players Graham Turner signed in the earlier part of his managerial career are now managers themselves. 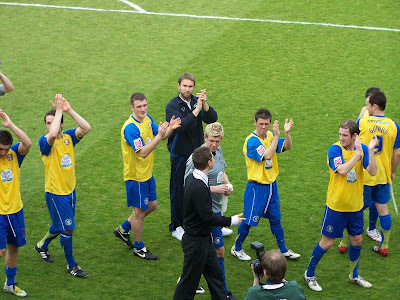 Tomorrow's opponents are no exception as Turner signed Nigel Pearson as a player whilst in charge at Shrewsbury. And whilst the odds will be on a Leicester victory, Turner may just take notice that they could only draw against Leeds at Elland Road yesterday. "To go to the Walkers Stadium will be a tremendous occasion. Usually we play better against the better teams," said Turner. "There's nothing to stop us looking forward to Leicester and seeing whether we can get something out of the game." Meanwhile Pearson knows the Foxes are favourites to win the game. "People might look on it as an easy game, but that is very rarely the case," he said. "I am not going to hide the fact that we were disappointed to lose a late equaliser at Leeds but now we need to be positive. "It will be awkward because we have to recover in a short time." Graham Turner has spoken to the Leicester Mercury about tomorrow's game at the Walkers Stadium. “It's been a big step-up for us," said Turner. “Three seasons ago, we were at the Walkers Stadium winning the Conference play-off final and now we're planning to go there again - but this time to play Leicester. The clubs have met three times in the last ten years. 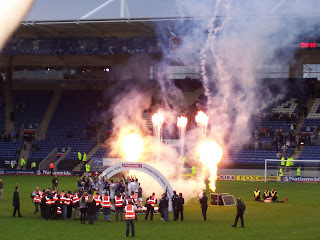 Two seasons ago Leicester defeated the Bulls 3-1 at Edgar Street in a Carling Cup game, but most supporters will have fond memories of the two FA Cup games between the two clubs in 1999. “There were five divisions between us then - the gap has since closed but that's the way the history of the club you support sometimes goes,” added Turner. 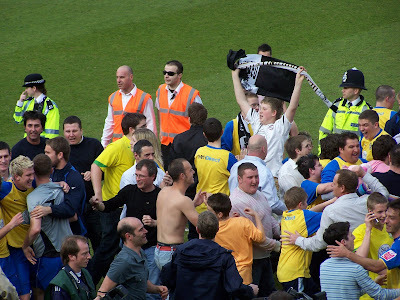 However, no doubt, the best memories from the Walkers Stadium for the Bulls will always be that wonderful day in 2006 when Hereford United defeated Halifax to regain League status. Bulls News reporter Kevin Goodwin told the paper that it was a superb spectacle. 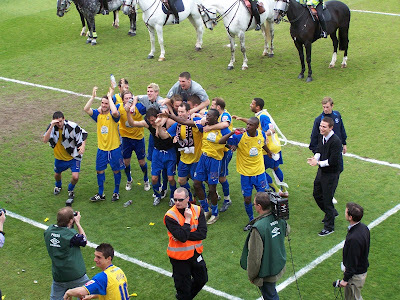 "We had experienced consecutive seasons of play-off heartbreak in the Conference, but that day we finally managed to win promotion," said Goodwin. Goodwin isn't too confident of getting much from the game tomorrow. “I can't see us getting anything. We'll keep it tight like we did up at Leeds (Hereford lost 1-0 to a 72nd-minute goal) and hopefully frustrate City while having the odd counter attack. This is a short reminder to get your Leicester predictions in. To enter the Bulls News Prediction League, simply send your final score and attendance predictions to bullsnewspredictions@hotmail.co.uk . Remember to include your username. You can also predict for the Leeds game a week today should you want to. The deadline for the Leicester game is at 2.30pm on Sunday 28th December. Tranmere manager Ronnie Moore has told the Liverpool Post that some poor defending cost Tranmere two points yesterday at Edgar Street. “Our strengths became our weaknesses today, it is disappointing to go in front twice and not hold on for a victory but some of our defending was poor and we paid for it. “Hereford’s second equaliser was very disappointing. We had a number of opportunities to clear the ball; it was like head tennis on the edge of our box. Meanwhile Steve Guinan thought the Bulls should have taken all three points. "Three months ago, we weren't creating a thing, but now we're creating a boatload," said Guinan. "When you score two at home, you expect to win a game – both their strikes were poor defensive errors." Swindon have named ex-Hartlepool boss Danny Wilson as their new manager. The 48 year old joins only two weeks after leaving the Victoria Stadium. Robins' caretaker boss Dave Byrne won only one of eight games in charge - today's win over Leyton Orient. Former Walsall boss Richard Money was originally offered the job but the club wouldn't pay the claimed £100,000 to end his Newcastle contract while Colin Calderwood, ironically sacked by Nottm Forest tonight, was also claimed to be in the frame. Gary Hooper scored Scunthorpe's second as they beat Hartlepool. Tamika Mkandawire scored Leyton Orient's consolation goal as they lost to Swindon. Scott Tynan gave away a penalty but then saved it as Northwich lost to Altrincham. Gareth Sheldon scored twice for Tamworth as they beat Hinckley, and Danny Carey-Bertram scored again for AFC Telford as they beat Stafford 3-1. An injury time equaliser saw Leicester's lead at the top reduced as the Foxes drew 1-1 with Leeds. MK Dons close the gap after beating Bristol Rovers 2-1 despite having a man sent off. Millwall are third despite losing 1-0 to Peterboro, who stay sixth. Scunthorpe beat Hartlepool 3-0 to keep fourth with Oldham's 3-0 win at Crewe sufficient to stay sixth after seventh placed Stockport lost 1-0 to Walsall. Down the bottom the gap remains five points for the Bulls after Carlisle beat Huddersfield 3-0 to move away from the target position of 20th. That place is now occupied by Leyton Orient after fellow strugglers Swindon beat them 2-1. Colchester were another to move clear, leaving Brighton in trouble after their 2-1 win at the Withdean Stadium. Yeovil drew 1-1 with Cheltenham to do neither side any favours, while Northampton are edging into danger after losing 1-0 at Southend. In League Two Wycombe lead by seven points after a 1-1 draw with Exeter. Brentford are second after a 2-0 win over Bournemouth, while Shrewsbury's poor run continues with a 2-1 loss at Rochdale dropping them out of the play-offs. Rotherham move up above two sides that started on zero after beating Notts County, but Luton will start 2009 with a negative balance after only drawing with Chesterfield. In the Conference Burton go ten points clear after a televised 2-1 win over York, with Histon only drawing with local rivals Cambridge. Kidderminster and Forest Green met at Aggborough for a 1-1 draw, while Northwich are ten points inside the relegation zone after losing 1-0 to Altrincham. As reported earlier Hereford United had a new sub-goalie on the bench this afternoon. Jose Veiga is his name and whilst he is said to be 32 he looks somewhat younger. "Situation where the transfer window had closed to emergency loans," Turner told BBC Hereford and Worcester. "We had to find somebody who hadn't been registered with, I think it's down to Conference North and South. "Jose came in and trained a couple of days with us. We were reasonably impressed with what we saw. "He's far better being our substitute goalkeeper than say having to put an outfield player in. As it stood it was always going to be Kris Taylor. But now I'm quite happy to have somebody who is used to keeping goal sat on the bench. "It's not a contract. He's non-contract and will sit on the bench for certainly the next two matches and then we will take it on from there." It was the first time this season that Hereford United have come back from behind to take a point which pleased manager Graham Turner but he was disappointed with the way the Bulls conceded both goals. "I thought we should have won it," Turner told BBC Hereford and Worcester. "There's two aspects of how it's going at the moment I think the first aspect is short-term. Todays game and last weeks game have been good spectacles. I thought that was a good game of football with plenty of excitement. Some good football played from both sides and plenty of goalmouth incidents. "But I thought on the balance of chances created we should have won it particularily in the second half. "Disappointed in the manner we are conceding goals at the moment. Both goals from our point of view I don't think Tranmere had to work too hard for. Basic errors but we did okay in coming back. "There was a lot of open play from us and plenty of room for that encouragement that we can still get out of trouble. "Disappointed with the outcome of it all but quite pleased with the level of performance. "We dug in deep when we went a goal down - there can be that feeling of here we go again, it's another setback - because it was a bad first goal. To get back into it right on half-time gave us a big boost. "We started the second half extremely well and we certainly should have scored more than just the one in the second half. But when they took the lead again - it was once again an individual error, a bad goal from our point of view - and again we bounced back and had one or two opportunities in the last fifteen minutes where I beleive we should have won the game." Hereford United picked up a point in their Boxing Day encounter with Tranmere Rovers at Edgar Street. Edrissa Sonko twice put the visitors into the lead in either half but on both occasions, they were pegged back by Hereford through goals from Toumani Diagouraga and Steve Guinan. Both sides pushed for the winner late on with The Bulls looking likely but they failed to find the winner in front of 3495. Graham Turner named an un-changed team following the encouraging display at Huddersfield Town, although there was one change on the bench with 'goalkeeper Jose Veiga appearing on the bench after a spell with Tamworth. Rovers were looking to gain revenge on their FA Cup defeat at Edgar Street last season and Ronnie Moore included the 'moon-walker' Bas Savage up front, whilst Steve Jennings started in central midfield; the Scouser spent a three month loan spell with Hereford in 2006/2007. Former MK Dons midfielder Gareth Edds sliced wide following a corner from the left whilst Kris Taylor's huth up field was chased down by Andy Williams but the local lad couldn't beat 'keeper Danny Coyne after he had rushed from his line, and the second effort by Williams was deflected out for a corner. A neat turn from Guinan following a quick throw allowed him to fire goalwards but his effort was straight at Coyne. Soon after, Ben Smith tried his luck from 20 yards but didn't catch it cleanly and Coyne again made a routine stop. Lionel Ainsworth should have opened the scoring when he controlled a Guinan flick and ran directly towards the visitor's goal, a lucky deflection fell back to Ainsworth who was through on goal but he couldn't compose himself and Coyne made a vital block from his strike. Savage put himself about in the final third for Tranmere and went close for the visitors following a dangerous Andy Taylor cross from the right but the big striker could only volley over from six yards out. Edds tried his luck from long-range again but like the first-time, failed to trouble Samson. Guinan used his body to hold off the challenge of defender Ian Goodison and play in Matty Done with a neat pass but a rush of blood to the Welshman's head saw him smash over from a fine position. The away side managed to take the lead towards the end of the half when a ball straight through the middle of the defence caught Josh Gowling out of position and Sonko raced onto the pass to neatly toe-poke past Samson and into the corner of the goal. United made a positive response to going a goal behind with Ainsworth's long-range effort surprising Coyne who pushed the ball away, before moments later, Hereford drew level in stoppage-time. Diagouraga picked up the ball just inside the Tranmere half and burst forward on the right; a neat one-two was played between Diagouraga and Ainsworth and the Frenchman continued his run into the box with the ball before blasting into the far top corner to equalise with his first strike of the season. Both sides came out in the second-half with attacking intent straight from the restart with an early Edds header dropping past the post and Diagouraga's excellent control allowed him room to shoot, but he dragged his shot wide. Flowing football from Hereford starting with Ainsworth on the right saw him find the run of Diagouraga up the line; the midfield sent a low cross into the danger area where Williams tried his luck but saw a shot blocked before falling to Ainsworth who tamely struck into the body of Coyne. Rovers, playing towards their travelling support of 468 in the second-half, went close through Terry Gornell as he collected a pass inside the box and turned Gowling but his effort flashed past Samson's far post. The visitors made no mistake soon after however, as they restored their one goal advantage. After some sloppy play on the edge of the box from Smith, the ball fell to Sonko was showed good skill to turn and fire past the 'helpless Samson from 20 yards. The lead lasted all of four minutes though as Hereford found an equaliser after some sustained pressure. An under-pressure Ainsworth found Smith on the right and his neat lifted pass into the box was chested down and hit first-time into the net off the post by Guinan to the delight of the home fans. The Bulls pushed on for the remainder of the match and were looking threatening although Rovers also created opportunities, with Sonko hitting a shot goalwards from 25 yards and narrowly missing the near post. Done was giving the Tranmere right-back John Johnson a torrid time on the left-wing and his cross was deflected to Guinan who hit a volley goalwards forcing Coyne into a smothering stop. Charlie Barnett replaced Gormell as Ronnie Moore looked to shake his attacking options up and his delightful cross from the left was touched wide by Sonko from inside the six-yard box. In the latter stages, Hereford continued to threaten with Done instrumental. The winger put a chance on a plate for Williams with a low-cross but the Bristol Rovers loanee somehow failed to make a connection. Done then picked up a pass from Dean Beckwith, running in from the left before hitting a 30 yard left footer just over the bar. As injury time loomed, Guinan switched the play to Done once more and he ran into the box but flashed a shot past the far post. In stoppage-time, Gowling's back-header put Samson in trouble with Savage closing in and the striker won the battle for the ball but his strike was well off-target. The visitors are pushing for the play-offs and a point, on paper, is a relatively decent result. However, on the balance of play Hereford deserved more with their attacking play, at times, a delight to watch. Guinan has hit a rich vein of form in recent weeks but unfortunately, it doesn't seem to be happening for Williams although his effort cannot be faulted. A proven goalscorer at this level is a must in January because Hereford need someone in the box to feed off the service from Ainsworth and Done. United's next encounter is a trip to table-topping Leicester City in just two days time. Hereford: Samson, Rose, Gowling, Beckwith, Taylor, Ainsworth, Diagouraga, Smith, Done, Guinan, Williams. Subs: Veiga, Broadhurst, Gwynne, Johnson, Chadwick. Tranmere: Coyne, Johnson, Goodison, Kay, Taylor, Shuker, Edds, Jennings, Sonko, Savage, Gornell. Subs: Achterberg, Antwi, Barnett, Creswell, Henry. Below are the stats from this afternoons very entertaining game at Edgar Street. Attendance: 3495 with 468 from Tranmere. Midfielder Toumani Diagouraga was given an eight for his performance with the remaider of the team getting either a six or a seven. A thoroughly entertaining display earned the Bulls a point in today's 2-2 draw with Tranmere. 3,495 - 468 from Tranmere - were well entertained by the end to end action and some well taken goals. The Bulls came back from behind twice through Toumani Diagouraga and Steve Guinan after Edrissa Sonko had scored each time for Tranmere. One new face for the Bulls this afternoon was a sub keeper. Jose Veiga, a 32 year old Portugese born Cape Verde international, lists Real Valladolid and Benfica amongst his former clubs and spent the last two seasons at Tamworth. Crewe have confirmed Gudjon Thordasson as their new manager, but he will not assume his duties until their FA Cup match on January 3rd. Leeds have appointed former Leicester coach Ian Miller to their backroom staff. He was a former teammate of new boss Simon Grayson at Blackburn 20 years ago. Tickets should also be available for the all-ticket Leeds game at home on January 3rd. Sunday 28th December 2008 KO 3.00 pm. Whilst many of the grounds we've visited this season have been a "first" for most fans, this one is certainly the exception to the rule having hosted around 10,000 Bulls' fans for the Conference Play-Off Final. I doubt there'll be many there on Sunday that didn't watch that game. The "Walkers" is an impressive 32,500 seater stadium that is reported to have cost some £35 million to build and is just a short distance from the old Filbert Street site. Visiting fans are usually accommodated in the northeast corner of the stadium between the Family Stand and the Alliance and Leicester Stand. Admission prices are believed to be Adults £23, seniors £21, U22's and Students (NUS Card) £15, U16's £10 and U12's £5. HUISA Departs Legends at 10.00 am Fare £12. Seats can be booked in Legends before the Boxing Day game against Tran mere or through the Club office (08442 761939). By Car: From Hereford, travel to Worcester to join the M5 north leaving at J4a to join the M42. Follow the M42 all the way to J7a where you join the M6 south. Leave the M6 at J2 to join the M69 (sign M69/M1). Continue to the end of the M69 (M1 junction) and at the roundabout take the second exit onto the A5460 (sign Leicester City Centre). After just under 3 miles turn right onto Upper ton Road then after the bridge, take the first right onto Western Boulevard where you will find the stadium on the right side. Distance is a shade less than 100 miles and you should allow two and a half hours. POSTCODE is LE2 7FL. Parking: there is usually plenty of parking in the streets around the stadium so long as you get there early and some spaces at the nearby Rugby Club if they have no game. Alehouses: Firstly, the Leicester Plod have a reputation for keeping a firm hand on visiting fans and take a dim view of any misbehaviour. Many of the Pubs around the ground are strictly home fans only including The Halftime Orange, which was our designated boozer for the Play-Off Final. The City centre, which has plenty of decent Pubs, is a good 15-minute walk from the stadium. The Gateway on (strangely) Gateway Street is a good size premises with real ales, some food and big screens. The Criterion in Millstone Lane is likely to be my choice as it offers a fine selection of beers, a decent reasonably priced menu and has been the Leicester Camra Pub of the Year on several occasions. The local Wetherspoons outlet is The High Cross in the High Street. Finally, The Swan and Rushes in Infirmary Square offers both Batemans and Oakham beers, which will be distraction from the abundance of Everards, found in many other houses. Crewe are set to appoint Gudjon Thordarson as their new manager. The former coach of Iceland, Stoke, and Notts County is discussing terms after accepting the club's offer to become their new boss, but he is unlikely to be in place much before the new year. Carlisle have extended the loan of keeper Tim Krul from Newcastle for a second month. Droylsden could be thrown out of the FA Cup after goalscorer Sean Newton was apparently suspended for the game with Chesterfield last night. He should have been on the sidelines after picking up five bookings. MK Dons pair Aaron Wilbraham and Sean O'Hanlon have both signed new deals with the club until 2011, but they have lost the services of loanee Jason Puncheon after he was recalled by Plymouth. Brighton are giving a trial to Southampton utility man Paul Wotton with a view to a loan for the remainder of the season. A Northwich fan will run a shuttle bus free of charge from the town centre to their ground for the rest of the season in an attempt to boost attendances. The club have also offered tickets for both their Christmas home matches for a combined £20. A consortium have agreed a deal to take over Weymouth. Two of the current staff at the club, a former director, and a representative of the Supporters Trust will form a new board with existing owner Malcolm Curtis putting another £150,000 into the club before walking away. Rushden will allow striker Daryl Clare to leave in the January window to move to a club closer to home after his wife fell ill while giving birth. Stafford hope for a bumper 1,500 gate against Telford on Boxing Day to see them through to the new year. Eight players and manager Steve Bull have left since their cash crisis became apparent. Conference attendances have fallen by just 2.5% overall, but several sides have seen dramatic falls. Torquay are the biggest losers with a 32% drop in crowds, with Stevenage seeing 25% of support disappear. Andy Penn from the West Midlands is set to referee the Boxing Day fixture at Edgar Street where Hereford United will entertain Tranmere Rovers. Director of a Plastics Moulding Company 35 year old Penn commenced refereeing in 1986 when aged fourteen. Ten years later he had made his way through local and CL football to join the National List of assistant referees. He was a panel referee from 1998 until 2001 when he was promoted to the National List of Referees. Married with two children his hobbies are gardening, marathon running and coaching rugby. Penn is well-known to Hereford United. He has already refereed one game involving the Bulls this season - the very first which was at Leyton Orient, the home side winning the game 2-1. Not one player from either side was booked that day. 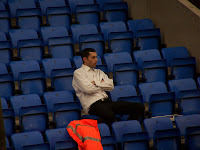 Last season he was in charge of the home game against Stockport which the Bulls lost 1-0. Bulls defender John McCombe was judged to have held back Liam Dickinson in the box. The striker then won the game when he scored from the penalty spot whilst McCombe received a yellow card. With Leeds United due at Edgar Street in just ten days time, an article, written by Chris Travers, has appeared in the Stoke Sentinel which sums up their present predicamemt and reminds them that they are playing in the same League as Hereford United. A WAVE of giggles rippled around the country on Sunday when Gary McAllister was sacked as Leeds United manager. Now that is no reflection on McAllister, who was an excellent player, but it highlights yet another sorry tale in Leeds’ recent history. A decade on from Champions League football, trips to Milan have been replaced by journeys to MK Dons, who inflicted a fifth successive defeat on Leeds to leave them five points off the League One play-offs. The management and behind-the-scenes staff are, no doubt, working hard to move the club through the divisions (in the right direction), but the reason Leeds are disliked around the country is their fans. For some reason, they are that deluded they believe they have a divine right to be in the Premier League. Well, years of mismanagement put paid to that I’m afraid. They also claim to be the biggest club in Yorkshire... although it is quite easy to reel off names of teams who supersede the Elland Road club. The fans must see the true picture and accept that they are a League One club for a reason... although new manager Simon Grayson has the pedigree to take them forward. 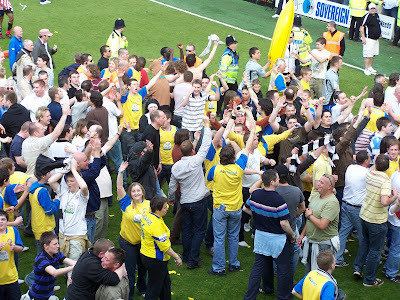 After festive fixtures against Leicester and Stockport, Leeds open up 2009 with a trip to Hereford. Edgar Street is certainly not the Emirates Stadium, and may just convince Leeds fans of their present standing in the game. Hereford United manager Graham Turner has spoken about supporters in his latest Hereford Times column. "I hope that supporters have appreciated the effort that the players have put in and, like us, realise that we have not always got the rewards that we have deserved," he said. "I would also like to think that they have enjoyed going to the new grounds, the better facilties, the better viewing areas. "Again, our support away from home has been first class. "Now with the pressure that comes from a relegation battle, some of the other stuff tends to disappear from your mind." Meanwhile Turner has looked forward to the Tranmere game on Boxing Day. "Tranmere will come and battle but we have got to maintain the level of performance we showed against Huddersfield and the results will come," he told the Worcester News. With many likely to be nowhere near a computer tomorrow, it would be a good idea to enter the Bulls News Prediction League today. Tranmere are the next opponents at Edgar Street this Boxing Day, and Leicester away follows two days later. To enter, send in your final score and attendance predictions along with your chosen username to bullsnewspredictions@hotmail.co.uk. The deadline for the games are at 2.30pm on their respective day. Hereford United and its Edgar Street ground are in an unique position. Although twenty or so miles from Offa's Dyke, some football supporters often think of the club as being in Wales. Chester City is a another example. Its ground is said to straddle the border. And whilst both towns have some odd laws relating to them, it now emerged that both towns might be better off being in Wales at least on Christmas Day especially if their inhabitants enjoy mince pies. Swansea-based solicitors John Collins and Partners (JCP) have come up with a top 10 list of the most ridiculous laws still in existence in the UK. Throughout the whole of England it is illegal to eat mince pies on December 25. In Hereford you can shoot at a Welsh person all day on a Sunday, with a longbow, in the Cathedral Close. You can shoot a Welsh person with a bow and arrow in Chester, if found inside the city walls after midnight. Taxi drivers are required to ask all passengers if they have smallpox or the plague. Any boy under the age of 10 may not see a naked mannequin. In Scotland it is illegal to be drunk in possession of a cow. Blackpool Football Club has issued the following statement about Leeds United's successful attempt to attract Simon Grayson to Elland Road. Following the statement issued on Tuesday lunchtime regarding Simon Grayson's resignation as manager of Blackpool Football Club, the board of directors would like to make the following statement. The board of directors can confirm Steve Thompson and Tony Parkes will take of first team affairs until further notice. The board would also like to confirm the events of the last 48 hours. Leeds United first approached us on Sunday afternoon requesting permission to speak to Simon Grayson regarding their vacant manager's position, this approach was immediately rejected by the club. Following a meeting with Simon Grayson on Monday morning, we reiterated our position to both Simon and Leeds United and permission was once again not granted for Simon to discuss the vacancy at Elland Road. Permission was refused for a third time following a telephone conversation whereby Leeds United made the club a derisory offer of compensation. Leeds United reaffirmed their position via fax once again requesting permission to speak to Simon and gave the club a deadline on 8pm to reply to the fax. The club, via e-mail reaffirmed their position and wished Leeds every success in their search for a new manager. On Tuesday morning, Simon Grayson via a hand delivered letter offered his resignation to the club which was immediately rejected by the board of directors. Less than an hour after the club had received Simon's offer of resignation, the Leeds Chief Executive once again contacted chairman Karl Oyston and reaffirmed their derisory of offer. The chairman once again informed Leeds that permission was not granted to speak to the manager. At 12.15pm, the club were notified that Leeds United "had been made aware" that Simon Grayson had resigned from the club's employment and that he had accepted their offer of employment as manager and that he had signed a contract with Leeds United. In light of the above, the board of directors have reluctantly reported Leeds United to the Football League for breaches of Football League regulations 20.1 and 20.2. In addition, the club are currently seeking advice from the Football League and the club's lawyers as to the breach of contract by Simon Grayson whose contract was not due to expire for at least another 18 months. The board feel Leeds United have acted completely unprofessionally and underhandedly and have shown a total disregard for the rules and regulations that govern football. Christmas time is here again and, no doubt, some people will receive presents they want and others will be disappointed. Here's a few suggestions. Scunthorpe have stripped Izzy Irekipen of the club captaincy and placed him on the transfer list after deciding not to offer him a new deal. The 26 year old has had a string of injuries during his 18 months with the club, and his deal runs out in the summer. Bristol Rovers management duo of Paul Trollope and Lennie Lawrence have denied speculation linking them with the vacant Charlton job. MK Dons keeper Willy Gueret has signed a new deal at the club for a further year plus an option for a second if he plays sufficient games. The 35 year old has been with the club for 18 months, keeping 30 clean sheets in 73 games. Crewe boss Dario Gradi is 99.9% certain to still be in charge of the December 28th match with Oldham after delays in finding a new manager. Yeovil are yet to start contract negotiations with Luke Rodgers despite agreeing a fee with Port Vale several weeks ago. His loan expires on the 5th, but the club appear to want to offload players before cutting a deal. Swindon are reported to have offered their manager's job to Danny Wilson. One time foes Fisher Athletic are the latest club in crisis, with the Conference South side deemed unlikely to finish the season. The FA have imposed a transfer embargo after former player Stevland Angus claimed for unpaid wages. Angus never appeared for Fisher, with the club claiming he was never fit. The Conference had already placed an embargo on them under their financial rules, and players have not been paid for three months leading to a rapid depletion of the squad. They travelled to Team Bath on Saturday with only eleven fit bodies after three players quit in the week, losing 4-1, and expect more departures soon at which point they will be unable to field a team. Since leaving their home ground five years ago they have shared with Dulwich Hamlet, meaning they have no matchday income as it all goes on rent. Ambitious plans to redevelop their own ground have failed, leaving it a derelict unusable shell. Meanwhile even well run Conference side (and we don't get many chances to say that) Altrincham have warned they are currently running at a loss. The part timers, who pride themselves on running a tight ship, note that the loss of potential TV revenue and an early exit from the FA Trophy has dented their budget and cuts are likely if finances don't improve. The board have successfully erased debts of old and have no intention of putting the club back in that position.